Set in ancient Rome, Blood & Laurels, will have you getting involved in a story filled with conspiracies, politics, cults, and much more. 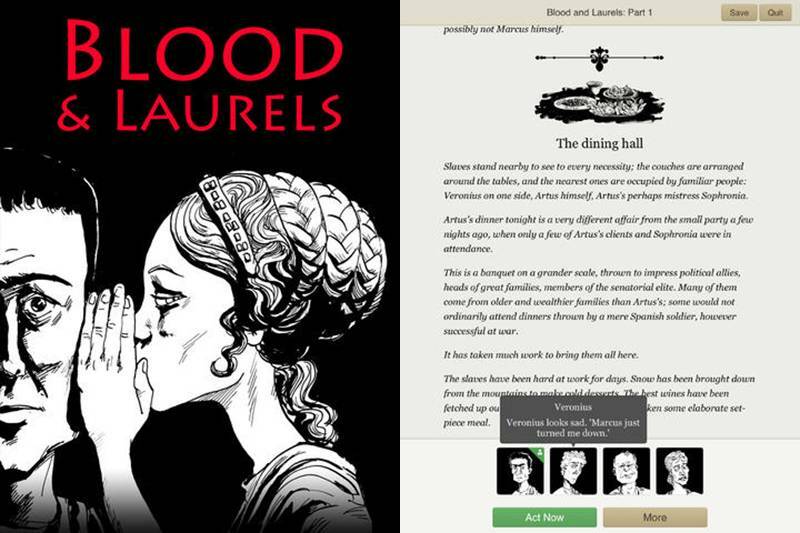 Blood & Laurels basically plays as an interactive book where you get to choose various actions during points in the story. You will be playing as Marcus, a devot poet, who gets sent by his patron, Artus, to ask a question of an oracle. This causes Marcus to get involved with all sorts of trouble. This interactive story is actually extremely good and I for one have not be able to get enough of it. The main thing I love about this game is how unique each playthrough can be where each choice will greatly affect various aspects of the story along with letting you uncover various secrets going on in Rome. Each character will even act dynamically to the player depending on past events, so you can decide who you want as a friend, who your enemies will be, and even decide on who you want to bump uglies with. Their is so much to this game that will require you to do multiple playthroughs without having to worry about the game becoming duller each time you restart. The developers boast that “a single reading encounters less than 20% of the possible text”. So if your a fan of ancient Rome or you just like a good story, you can download your copy of Blood & Laurels for only $2.99 in the App Store now (only for iPad).